My various dabblings with the computer hardware and software. Part of my reason for choosing the Sony Smartwatch was to acquire a one-box running solution, that could track my runs and play my music without taking up too much space. I find a 5.5″ phone far too cumbersome to run with, as I’m sure most of us do. Tracking runs on the Sony works well – but to see whether I could make good use of the music player, I needed to get hold of some Bluetooth headphones. Since this experiment could have ended in complete failure, I didn’t want to spend UK high-street money on a branded pair. The ones pictured above cost me somewhere in the region of £5 shipped from China. Cheap as chips! The reviews on GearBest are almost universally extremely positive and each one seems to include the same style of picture and the same kind of comments. I have my suspicions about their authenticity. There are also quite a few YouTube “reviews” which are basically an unboxing. Nothing useful there. The ‘phones come in a box which looks the part, complete with specs in Chinese script of some sort. There are no English specs. I don’t understand them, but I’ve included them because you might. Inside the box, you also get a (virtually useless) printed manual and a spare set of tips. The black ones are fitted to the headphones as standard and the translucent ones are the spares. Curiously, they are both about the same size, albeit different in style. I would rank them as a “medium” fit. The headphones themselves are a sports style and use a rubber “finger” to grip the inside of your ear and stop the earpiece falling out. I have some JVC headphones which use the same design (they call it “pivot motion fit”) and it works for me. It may not work for you. Included in the box is a small clip and a rubber grommet. I’ve used them to clip the ‘phones to my top, and adjust the amount of loose cable. It seems like a pretty decent guess considering the instructions make no mention of them whatsoever. The earpieces are not too big – excluding the “finger”, they are about 27mm total depth and 15mm diameter. They don’t feel oversized in my ear. The standard rubber tip is too small for me, so I fitted some larger tips from a set of JVC headphones. The remote hangs on the right-hand side of your neck and is 50mm long, 12mm wide and 10mm deep. It looks and feels cheap, with visible moulding seams along the side. It has a built in micro-USB charging point and what I assume is a hole for a microphone. I have used them for 2hrs without needing a charge – I am afraid I am not sure what the maximum life on a charge would be. The buttons bear no relation to their function as headphones. They might make sense if you take a call – but I’m afraid I haven’t tested that. The middle button is the power button. Push and hold to to switch on, do the same to switch off. When powered up, the headphones will become available to pair (flashing red and blue lights under the “+” button). I’ve successfully paired them with my smartwatch, my phone (Moto G4 Android) and my laptop (Windows 10 – although it thinks they are a keyboard). When the headphones are powered up, the blue light continuously flashes which is both unnecessary and annoying. When listening to music, a brief push of middle “phone” button plays or pauses the sound, the “-” button skips forward a track, and the “+” button skips back. What could be more logical! You can also press and hold the “-” button when connected to a mobile phone, which will trigger what it calls “camera” mode. Effectively this seems to make the “phone” button act as a key that will select the default option on a page – it doesn’t automatically open your camera app. Unless this is some kind of bluetooth functionality that pro photographers use, I can’t see the point of it. I suspect the hardware inside is some sort of multi-purpose bluetooth chip which might explain why the headphone controls are so crude. The good news is, the headphones do work, and they will pair with a standalone Android Wear watch; an Android phone; or a PC. I haven’t tested on Apple. The not-so-good news is that the sound quality is pretty poor. After switching to the larger JVC tips, the bass extension is good, finding greater depths on albums like “The Prodigy Experience” than my other (inexpensive) JVC FX34 and ETX30 ‘phones, without being boomy. However, the whole sound is very closed off, with the treble being particularly muffled, which really limits the soundstage and dynamics of the music. There is also an issue with the unrestrained cables shaking around inside the earpieces, creating a noise as you participate in your chosen sport. The metronomic tapping is very noticeable when running. I might try and solve this by applying some rubber cement where the cable meets the plastic body. At least the short cable of the bluetooth headphones doesn’t get caught up in things like a long plug-in cable does! Your £5 will get you a functional product. But there is no doubt it is a cheap product, with a crude finish on the remote, illogical controls, and poor sound quality. When they break, I won’t be buying them again. P.S. If you have any questions or comments, please add them below! Did I mention SyncToy yet? Hey Lenovo, what’s up with DPTF & Yoga machines? – Lenovo Community. To disable DPTF, boot up the Yoga with the Novo button (the small recessed button with arrows on it next to the normal power button) and swap DPTF to Disabled under the Configuration menu of the BIOS. I gave Windows 8.1 a fair crack of the whip. Two or three weeks of trying to use it the way Microsoft want you to use it, and trying to be productive at the same time. But it just couldn’t happen. Time and time again I found myself right clicking on the Start icon (it’s not really a button) to bring up the control panel to hunt for settings. And if you want to search for recently used programs or files… fuhgeddaboudit! So I installed Classic Shell. It’s free. It’s brilliant. It makes Windows 8 work like Windows should. Now I am in the process of eliminating all the Metro App versions of useful programs (Scan, Calendar etc.) so that I can stay on the desktop all the time. Metro is only good for games and casual use. In summary, Windows 8.1 is still a compromised desktop OS with a worthless tablet OS pasted onto the top of it. The question is, how long will it take Microsoft to admit it? PS I’m growing fonder of my Lenovo Yoga 11S. Although I thought it was too small at first, I’ve grown accustomed to the size and I find it very convenient, just the right size to carry in my bag (even in its Caselogic sleeve it is smaller than an A4 folder), and just the right size for my lap! I do miss the dedicated Home and End keys, but that’s about it. I appreciate the speed of the SSD drive and the general quietness and coolness of the machine as a result. The party trick of flipping the screen almost prompts a round of applause whenever people see it. I rarely use the machine in full tablet mode because it is quite heavy, but I often use it in its part-folded state as a tablet-with-a-stand. The screen is nice and bright and responds well to touch. 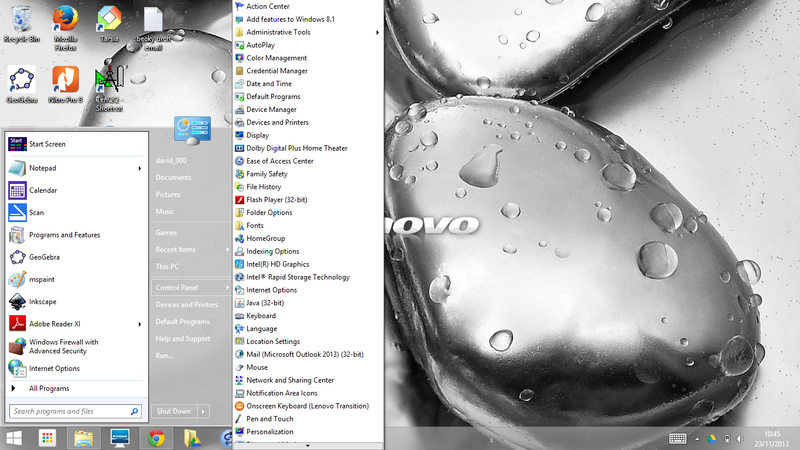 The touchpad is a decent size and can be customised with the Synaptics driver on the taskbar. The keyboard is poor, very little key travel and rather a gummy feel to it to. I also find the lack of a dedicated End and Home key to be a pain when typing. The power button is exceptionally small and rather vague, while the volume rocker works in the opposite direction you would expect it to. The machine is slender and although connectivity is at the bare minimum it is enough for my needs. The Core i3 processor seems fast enough for my needs. Battery life has not been a concern to date, but it is internal which would be a pain if it needs replacement. The 11.6″ screen is really too small for desktop programs (it’s hard to use touch on menus and the typefaces are very small unless you zoom in), however it is also about the largest you could cope with for tablet use – I’ve tried the 13″ Yoga as a tablet and it feels colossal. The machine is very portable and even in a padded case is smaller than an A4 folder. Windows 8.1 is a distinct improvement on 8 but it is still well short of where it should be. Microsoft remain stubborn about the amount of control they will let users (easily) have, and although the Start button has sort-of returned (if you right-click on it) it is still far less usable than a real Start button. At least the search function and the store have been greatly improved, as has the introduction of a dedicated apps screen. Internet Explorer for the “Metro” UI is far and away the best touch browser at the moment but it has serious shortcoming. You can’t use an ad-blocker and certain scripts won’t work, so for instance many of Google’s web-based apps become problematic. I look forward to a decent rival. After a little while you realise that the Metro UI and the Desktop UI are not integrated at all, it’s really two operating systems in one. The Metro UI is OK for leisure, but if you want to be productive, you need to use the desktop, and that can be a pretty time consuming experience because so many functions are hidden away and require a swipe from the right to do a search if you have any hope of finding them (not all of us have memorised every keyboard shortcut). My last everyday computer ran Vista and you notice how much faster Windows 8 is. At this stage… probably not. I’d buy a 13″ laptop with a better keyboard and I would use it exclusively in Desktop mode. Metro UI and the flipping screen are not much more than gimmicks. Having said that, it does take up a lot less space on the desk in tablet-stand mode and can be quite good for showing documents to other people, so there is a small benefit to the design. Just not one that justifies the price premium! Even as the edifice of Windows collapses around them (Windows 8 is an utter disaster), Microsoft keep churning out little gems that are totally free. Small Basic is one of them, a BASIC-style programming language that is easy to get to grips with and surprisingly powerful. I managed to write a program that uses Zeller’s algorithm to calculate the day of the week you were born on within 2 hours of downloading it for the first time. You can see it here. After a solid day’s head scratching and a restless night dreaming of drivers, I have finally got this (old) photo printer working on this (old) laptop. 1. Download the v3.4 driver for Vista 32-bit – Canon Europe is one location. 2. This is important – unzip the cp710x32mux.exe file – the self-extractor wouldn’t locate the printer port for me. 3. Run CNYCPINS.exe in the CP710 folder. 4. Follow the instructions and your printer should be installed. My computer popped up a “This program may not have installed correctly” warning which I ignored. The Selphy is still a handy tool for printing out the odd snapshot, although it works out a lot more expensive than the supermarket printing booths nowadays. Unfortunately, the CP710 won’t read modern high-capacity SDHC cards which makes the slots in the front effectively redundant.